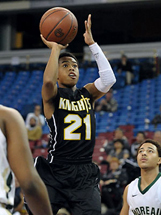 Long Beach State assistant basketball coach Rod Palmer had watched Bishop Montgomery’s point guard Justin Bibbins for several years before he decided to offer the polished 5’7 high school stand out a scholarship. Bibbins fell into the category that most short basketball players fall into. He’s just not tall enough. However, height does not measure intelligence or heart, two ingredients that Bibbins has had since he started playing basketball as a six year old in Carson. Palmer was not alone in his evaluation of the pint sized Bibbins, but those other schools had waited until the last minute and by then Bibbins had accepted his scholarship to Long Beach State. The John R. Wooden Award as the CIF Division IV player of the year as a senior will be the starting point guard. Local high schools that have had to compete against Bibbins such as Westchester’s Dewitt Cotton Bibbins is glad he’s finally graduated. Bibbins led Bishop Montgomery to the Trevor Ariza Tip Off Classic at Westchester two consecutive years in a row. Bibbins coach during his glorious four year run for the Knights, Doug Mitchell said that he has never been as close to a player during his 25 years as he was to Justin. He has that unique intangible to make other players around him better as evidence in his senior season at Bishop where Mitchell has his youngest squad ever and it won the State Championship. Bibbins finished his high school career at the Collision All Star Game as the boys MVP, leading the Southern Section over the City Section all stars. He follows another Collision All Star MVP-Casper Ware- to Long Beach State. Like Bibbins, Ware was only about 5’7 but led the 49ers in points and assist during his final two seasons. Last season Bibbins led Bishop Montgomery to a 28-6 record and an appearance in the Division IV State Finals, scoring 12 points with nine rebounds and four assists in a dominant 85-44 victory. He also led the Knights to an appearance the Southern Section Open Division Playoffs and averaged 21.3 points, 5.4 assists and 3.8 rebounds as senior. A two-time first-team All-Del Rey League selection, a two time All-South Bay first-team selection, and a two-time CalHiSports all-state selection .He Led the Knights to a 32-2 record as a junior. Rated as a 3-star recruit by ESPN and the No. 17 prospect in the state of California. Listed as one of the 50 best senior guards by all major scouting organizations. Simply put, Justin Bibbins finished his high school career as one of the best point guards in the history of Southern California. However, he has no illusions of playing professional basketball and has his sight sets on becoming an FBI Agent. Wherever the road leads, Justin Bibbins will make that organization a winner and good things are in store for Long Beach State.